It's not often I would write a post like this, but a month ago I was looking at what I do all day and realised that there was one part missing, one part which made me feel so horrible inside. You see, my days are filled with blogging, sorting the kids and housework. A quick run down would be that I start off by getting the boys up, fed, cleaned and ready for school whilst also giving Joseph his bottle and changing him. Once they're at school, apart from sorting Joseph for a feed, he sleeps in the morning so I do some blogging. At lunchtime I pick Charlie up from nursery and he has lunch and then off he pops to play and I get on with more blogging and housework. Thomas is picked up at 3pm and then it's a rush of cooking dinner, playing on the Playstation with Thomas, reading, writing and doing homework with Thomas and then bath time before settling for bed. Throughout all this time, sorting Joseph and cleaning as I go. Did you notice anything that was coming up short? I did... Charlie. 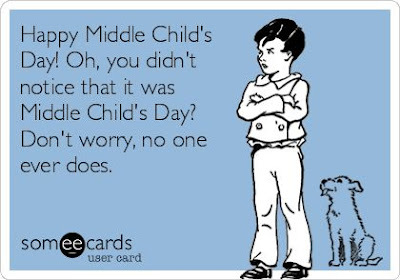 My middle son, my middle child. He just doesn't seem to factor in much. I was heartbroken when I actually realised just how much he seemed to get ignored. Well, not ignored really but he just seemed to go with the flow and let both other boys get my attention. I know people always talk about the 'middle child syndrome' whereby the first child get attention as they're the first born, the third child gets attention as they're the last child but the middle child, they are just there, stuck 'in the middle' going with the flow. When I think back to when I was younger, I understand it too. 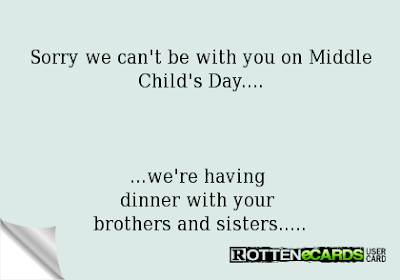 My dad had 2 older daughters from a previous marriage but with my mum, he had a daughter, me and then my brother, essentially making me the middle child of our family. My sister was loud, always making sure she got the attention and of course my brother was the only boy so he was doted on, but I just seemed to get on with things. Everything passed down from my older sister and not really understood. Not gone, just forgotten... Okay, okay, I may be being just a little bit melodramatic, but when you're a child and your parents are focusing on helping your big sister with school work or cooing over your baby brother, it does make you feel a little ignored. So I understood how Charlie was or would be feeling when he starts to realise that all peoples attention is placed on his older or younger sibling. It's now time to change! If you read my blog regularly, you will realise that I no longer post new posts each day like I used to. This isn't because I have no content or nothing to wrote about (gosh, I still have our Cayton Bay holiday to write about) but it's because I have been trying to focus my attention on my middle child, making sure he doesn't feel left out. Now when he returns from school we get playing together. Whilst Joseph sleeps we play board games, with his cars, out in the garden and try to get as much fun in as possible. This has meant that my blogging has slowed down a little and I find myself being behind with posts which is now why I am trying to catch up by blogging at night taking up my free (usually watching television) time. As any parent knows, babies need a lot of stuff. Humongous amounts when they are newborn but, when they get to around 6 month old, you will need to start gathering more and different items and products, ready for their next milestones. All the fun of weaning comes in to play, that messy time where babies get to try new foods and make a mess and then teething starts soon. This can be hard for parents and baby as we need to watch our little ones suffer with not much we can do. So when Chemist Direct got in touch to ask if we needed anything, I jumped at the chance to show what I bought for Joseph now he is about to hit 6 months old. Chemist Direct is an online shop where you can purchase medicines, toiletries, travel essentials, baby products and you can also order online prescriptions too. It is a hassle-free convenience as there is so much choice and there are no long queues, win, win! I got to work scouring the site to find the essential extras I would need for Joseph over the next few months. Whilst around, I noted how easily I could find toiletries for myself and hair care deals (will be ordering some of the fab deals for myself in due course!) but I personally thought that the baby items were a little harder to navigate as there isn't one dedicated area just for them. Under 'medicines' you can get baby and child care such as nappy rash ointments, colic, teething aids and pain remedies but then flick to the 'health and wellbeing' section for mother and baby items, everything from conception and baby health to weaning and teethers. There is also baby haircare products under the 'toiletries' section. For me, I prefer if I can easily find everything. If there is one thing I dread, it's trying to find similar products on a website but there all in different sections. Ideally, there could do with being a 'Family' section just for these types of items. Anyway, back to the shopping and you can see our whole haul in the above picture. I'll break it down a bit shall I?! The teething stage is a horrible time. There is not much you can do as those pesky teeth need to push through, but there are ways that we can help to ease the pain. Teething gels such as Dentinox are a great way to numb the gums and ease the pain a little and are only usually a couple of quid to buy. Chemist Direct have it a little cheaper if you bulk buy as a pack of 3 so now's the time to stock up. There's also Bickiepegs teething biscuits which are finger shaped hard biscuits. They are shaped to help the development of a baby's teeth, jaws and chewing skills whilst also easing teething pain. To help with teething during the night and those longer periods where the tooth is pushing through, I like to give a small amount of oral suspension paracetamol. You can buy expensive brands of this but to be honest, it's only the same stuff. 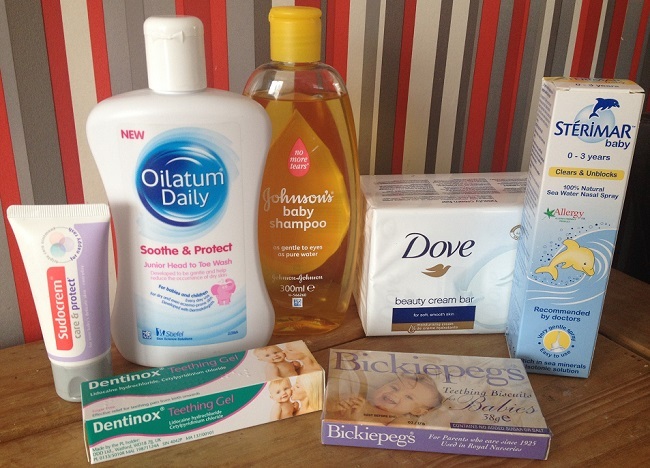 Stock up of essentials like Dove soap which is great for sensitive skin, Sudocrem for nappy rash and a lovely baby shampoo which is delicate for little ones. Joseph also needs a good quality bath wash such as Oilatum Daily Soothe & Protect Junior Head To Toe Wash which works to reduce symptoms of dry skin and eczema for children and babies as he is prone to eczema on his face. Nasal spray and the NUK Nasal Decongester are also good things to have to hand just in case your baby gets blocked up. There's nothing worse than a baby that cannot drink milk due to a blocked nose. I never find the need for big, expensive products like blenders and such. I think, apart from the actual bowls and spoons, a good quality masher, such as the NUK Annabel Karmel Masher & Bowl will do the perfect job to give a good baby food consistency. If your on your travels or need food in a hurry, it's always good to keep a few jars in the cupboard too, just in case. There are some great flavours to choose from to suit your baby's needs. 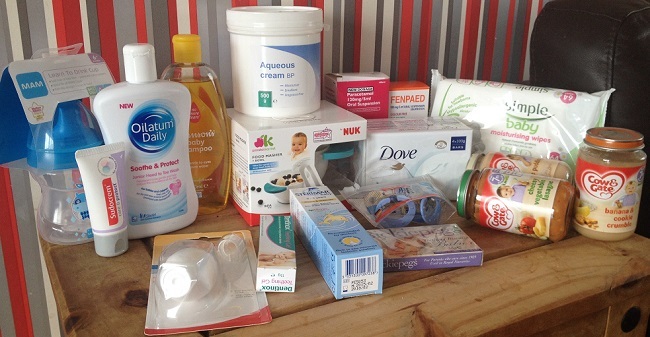 I chose a few extras in my haul such as Aqueous cream as it's a miracle cream and you'll never know when it's needed, a MAM Learn To Drink cup and some Simple wipes which are perfect for cleaning up those weaning messes but are still gentle on the skin. Overall, I think this is some of the essentials I would advise that you need when your baby turns 6 month old, can you think of anything that I've missed? Pop over and follow Chemist Direct on Twitter to keep an eye out on their deals and offers, and they also hold competitions on there too. 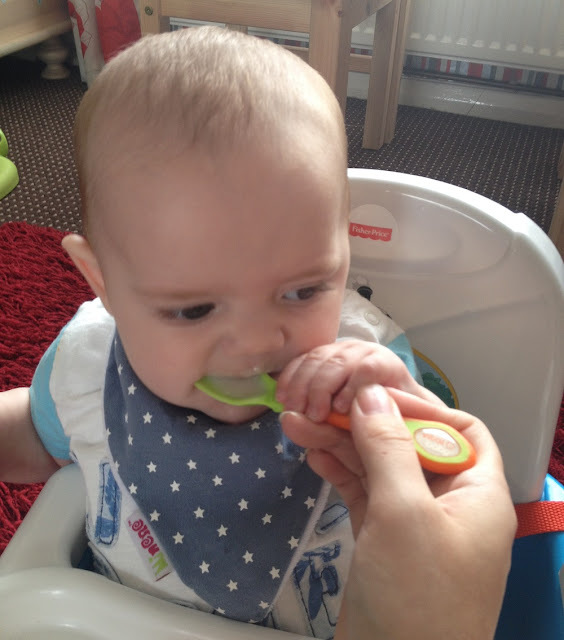 When it comes to weaning, this time fills me with a mix of emotions. It means that my baby is getting older and at the right age to give foods a try but it also means that my baby is getting older. 5 month old. How can Joseph be 5 month old already, time is passing way too fast. But now, back on to the task in hand, weaning. I love the weaning stage. It's a time where you get to know your baby's likes and dislikes when it comes to food and where you have the best opportunity to give them the best start in loving food by trying them with so much variety. 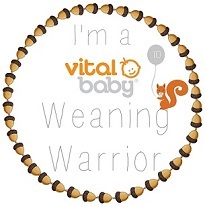 We are lucky as Joseph and I have been invited to be Vital Baby Weaning Warriors. 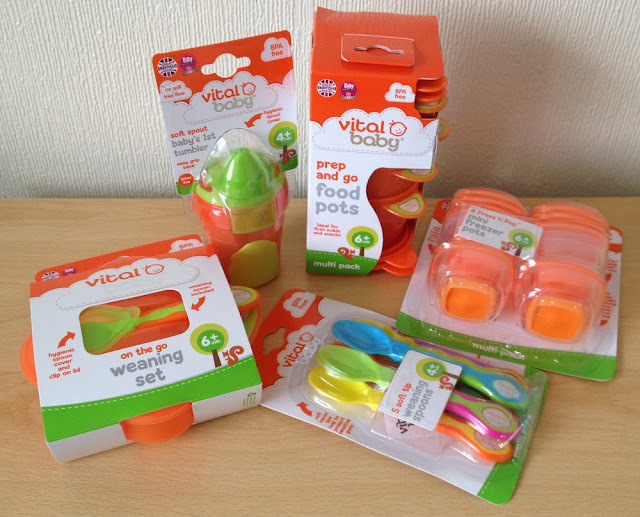 Vital Baby have a whole range of weaning items, perfect for those starting out on their weaning journey. Sending us out some items to help with this new venture, it has been great seeing Joseph soar at this new task. 1. Offer your baby a wide range of foods so she gets used to different flavours and textures. Babies naturally like sweet foods to start with, but offer slightly bitter foods too such as spinach, broccoli and green beans. Don’t be surprised if these are rejected at first. Every time you try, the chances of success increase. 2. Let your baby set the pace. ‘Responsive feeding’ is key, so if your baby shows signs that he’s had enough don’t keep trying for one more spoonful. Teething and colds can put a baby off their food and pressure to eat will just cause food battles. 3. Don’t give too much milk, as this is one of the main reasons for babies not taking to solids. Babies under 12 months need 3-4 breast feeds or 500-600ml of formula a day and giving more than this can make them too full for meals. 4. Give your baby plenty of opportunities to handle food. Whether you’re starting with spoon-feeding or baby-led weaning, give some finger foods every day. Steamed vegetables such as carrot sticks or pieces of broccoli and soft fruit like bananas and pears are ideal. 5. Make meal times enjoyable by sitting and eating together whenever possible. If you relax and take your time it will help your baby develop a healthy relationship with food. I know that the new guidelines say that weaning should start at around 6 months, but that's exactly what they are, guidelines. I always say that a baby is ready for food at the point when they start taking notice of your food and getting mad that they aren't joining in with munching on it. With Joseph, that was a couple of weeks ago and so I knew that he was ready for this new challenge. Joseph has taken to weaning like a duck to water. Ready to try out a range of different foods and tastes. At the moment we are sticking with rice, breakfasts and fruit/veg due to him being under 6 months and not wanting to give him meats or cows milk based products until he reaches that age. So far, I'm happy to say that he's loved it, parsnip and potato purée being one of his favourites and mango is a no, no as he spits it out with a look of disgust. I really cannot wait for him toe reach the 6 month mark so that I can start making him full and proper meals from scratch. Then the real fun begins! Being a lover of big, bold colours, it would make sense that Cosatto is a brand I love. Their motto 'Baby stuff with personality ' suits me to a tee and I have tried to bring the boys up to like a wide range of diverse colours and not be put in to any box. 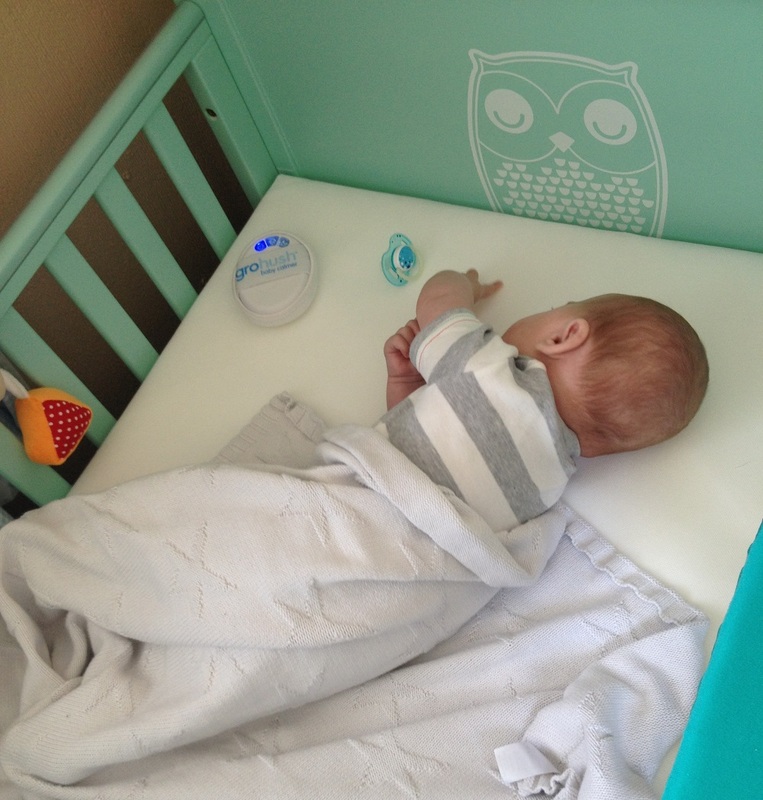 So when the Cosatto Story Owlet Cotbed was released, I knew it would be another winner. 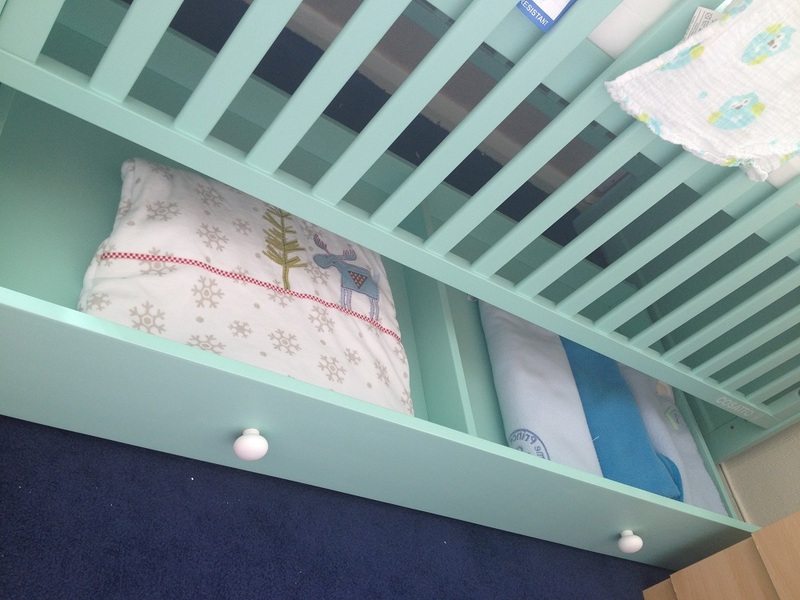 I first saw the Cosatto Story Cot Bed last year when I visited their HQ on a press day and instantly fell in love. The bright colours stand out from the crowd and give a focal point in any baby's room, just as bright and amazing as their prams and car seats. 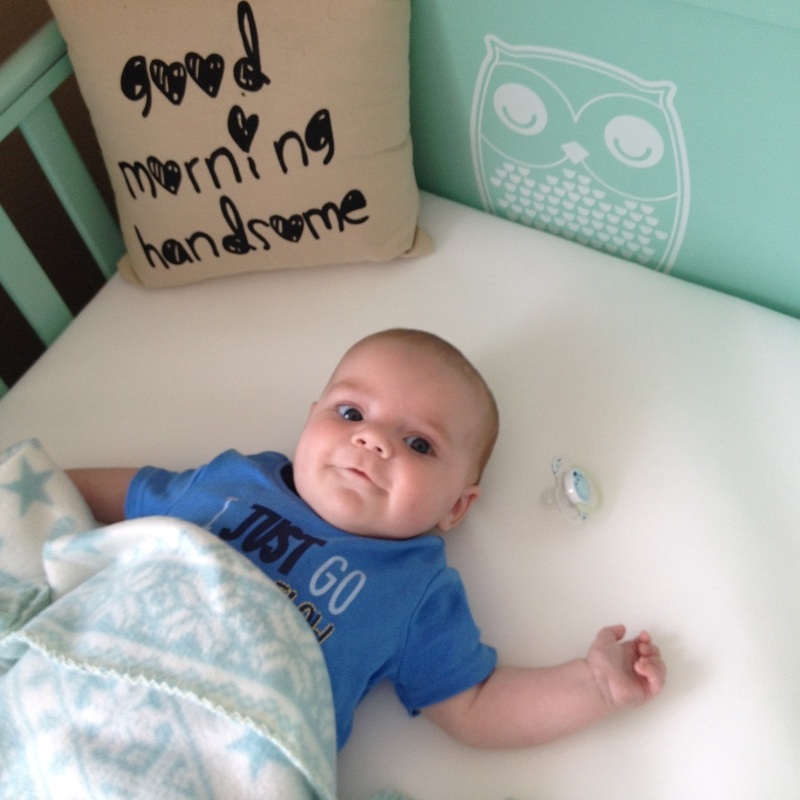 The Owlet is the newest of the Story Cot Beds and I personally think that it was made with Joseph in mind. You see, when I found out I was having our third little boy, I instantly knew that the theme of his nursery would be owls. Seeing the Owlet Cot Bed was a sign that I was on the right track and I then began building his room around this design and colour scheme. 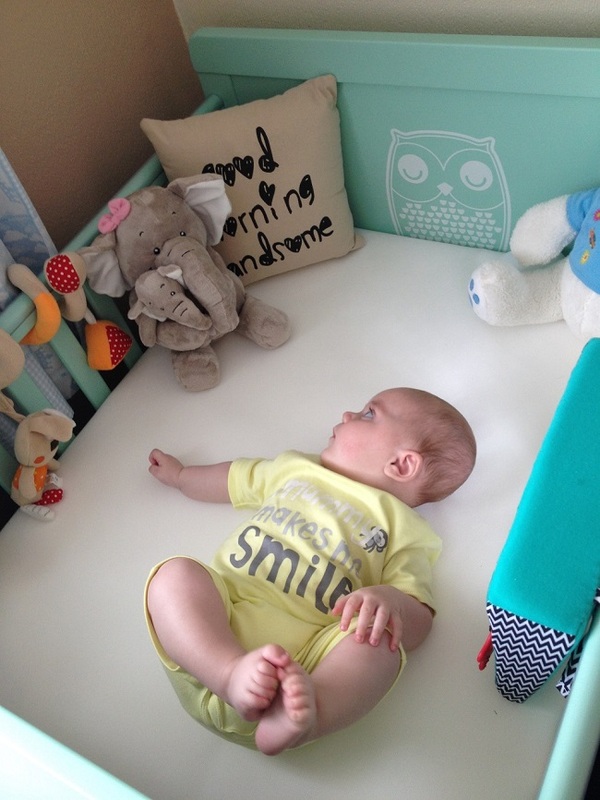 Cosatto’s Story cot bed has surprise after surprise. not only does it come complete with an under-cot drawer and cot-top baby changer but there is no need to buy a separate junior bed as, the cotbed comes with a panel for easily changing to a junior bed. It can also convert to a sofa too to make it a 3 in 1 bed and last the years. The Cosatto Owlet Cotbed is a stunning piece of furniture. I adore the light mint-green colour with the owl design. It is a style and colour that can be suitable for either boy or girl and creates a peaceful environment to settle down to sleep. I love how the colour matches in perfectly with the colour-scheme in Joseph's room. Although, to be honest, since it is a soft mint-green in colour, it can gel well with pretty much most colour-ways. 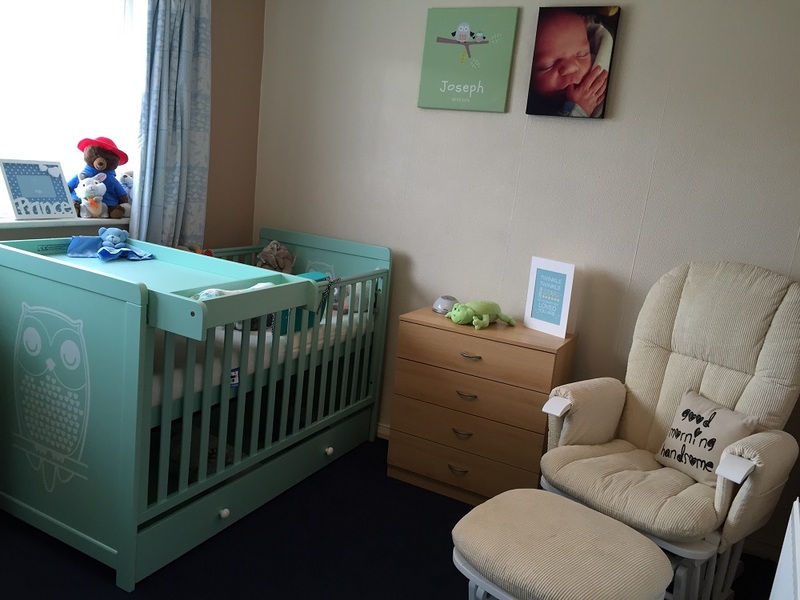 Joseph's room is cream and mauve and having this cotbed against the subtle background makes it stand out with pride. The Cosatto Story cotbed is a 3 in 1 as it can go from a cotbed, to junior bed and then a sofa and is suitable as a cotbed from birth and the junior bed up to 5 years old. Then being converted to a sofa to last the years. 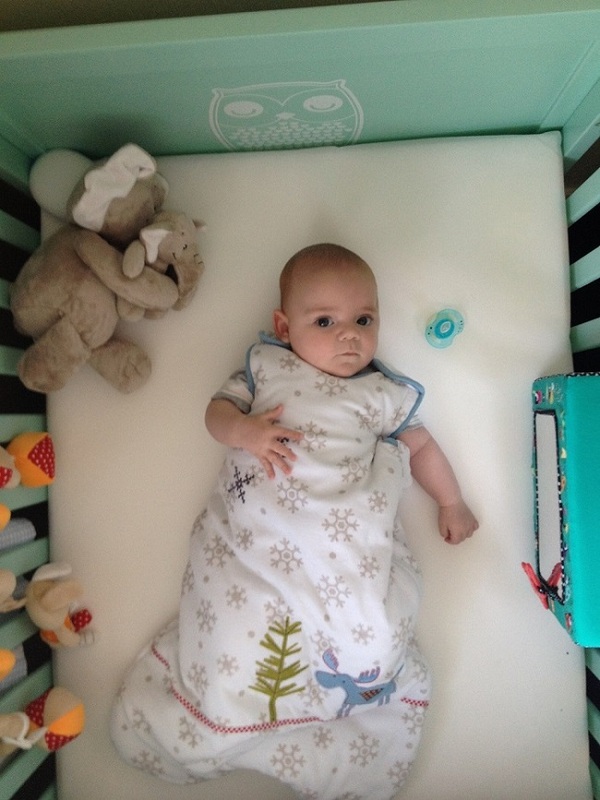 It has safety teething rails and the mattress can be positioned into 3 heights, so as to be lowered as your baby grows and can move around more. Coming with a matching cot-top changer and under-cot drawer to just add to the possibilities with this cotbed. The cotbed undergoes the equivalent of a 10kg child jumping on it 1000 times in 5 different spots to make sure that it is safe and sturdy enough to take a baby and growing child over the years without being compromised. I love how Cosatto make sure that their products are super safe for babies and it puts my mind at rest when purchasing big baby items, knowing that they have been tested out to such lengths. Since I was in charge of little Mr Joseph, my husband was in charge of the build. This filled me with a sense of trepidation as he isn't the most DIY averse person. His best tool is a hammer so I was apprehensive and ordered him to call his friend for back up. When it came to building, it took maybe an hour to get it all up and running although there was a lot of colourful language coming from the nursery whilst they were struggling to get the allen key to turn whilst tightening the underside of the cotbed. When it came to sorting Joseph's room, I was stumped as to how everything would fit in. He has the smallest of the bedrooms in our house and this became a problem when I wanted to start buying for his room. We had drawers for clothing, the nursing chair and the Owlet cotbed which take up most for the space. Knowing that we would be needing extra space for blankets, sleeping bags and nappies whilst also having somewhere to change Joseph and dress him after bath time, I knew that this would be a stretch to fit anything else in. That's why the Cosatto Story cotbed comes in handy. 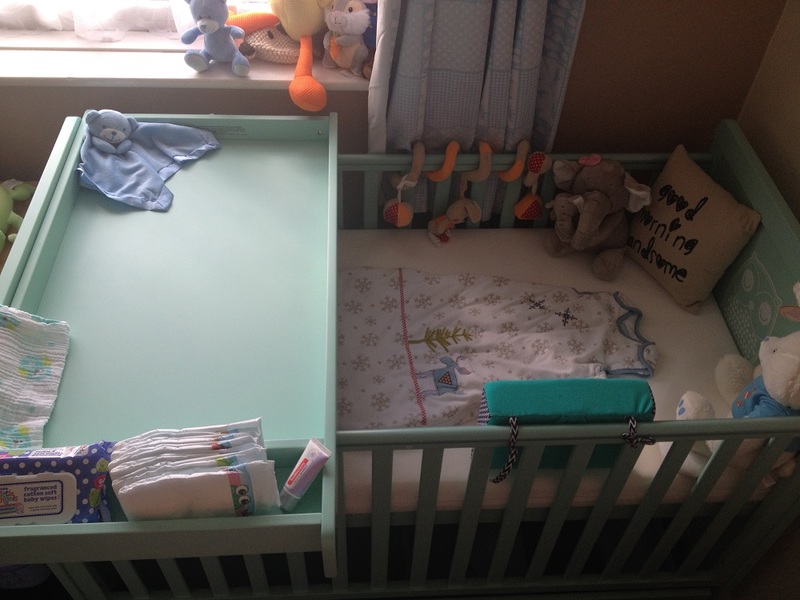 The storage drawer underneath makes for a perfect place to store all Joseph's spare blankets and nappies, in a spot that is easily accessible when either in the cotbed and needing a spare blanket to keep him warm or for nappy changes on the cot-top changer. Then of course, comes the cot-top changers. How handy is this?! Sitting on top of the cotbed and fastened at the back to stop it from tipping off, it has a large space for Joseph to lay on whilst I am getting him dressed, undressed, changing his nappy, and 2 little compartments to store spare nappies, wipes, creams, whatever you need really. The Cumfi Kip Cot Mattress is super soft and has been filled with a luxury fibre filling to give that top quality edge. It has a removable cover which is breathable and waterproof to protect against any accidents and can be washed at 60° to give a thorough deep down clean. As with all Cosatto products, it comes with a free 4 year guarantee which puts my mind at rest knowing that Cosatto are so confident in their products safety that they will protect them for so long. It also comes in 3 sizes, crib, cot and cotbed. It fits perfectly in the cotbed with no room between the edge of the mattress and the sides whilst giving a comfy place to lay and sleep. So, did Joseph take to to using the Story cotbed well? I am happy to say that he did. I was planning to have to cotbed in our room and slowly transition Joseph into sleeping in it but due to the size of the cotbed and it being wide and our doors being small, once it was built in Joseph's room, we could not move it out without taking it apart. And for the simple fact that the base is hard to attach underneath due to limited space to fasten with the allen key, this was not an option. So instead, Joseph ventured into his own room and this actually came with its own advantages. As Joseph was now in his own room on a night, he actually slept more. I think it was a mix between sleeping in a new place which was big enough for him to move around and comfy for him too, and also the fact that he now wasn't woken by myself and my husband moving or snoring on my husbands part. So overall, the Cosatto Story cotbed is a winner in my eyes. Not only is it a beauty to look at and have so many options with regards to growing older with Joseph, but the cot-top changer and under-cot drawer means that it is a great space saving product too. Joseph is loving his new cotbed and now only wakes once in the night for a feed and often, not at all, and that's a big plus in my book as now mummy is getting some much needed rest! And here it is, Joseph's finished nursery in all its glory, what do you think? Have you ever tried lifting a baby out of the bath whilst simultaneously holding a towel with your chin to wrap around said baby? It's hard isn't it, and most of the time it doesn't work, you'll just be stood there trying to grip and slippery baby whilst the towel flops to the floor. Yes, I have done this many times. 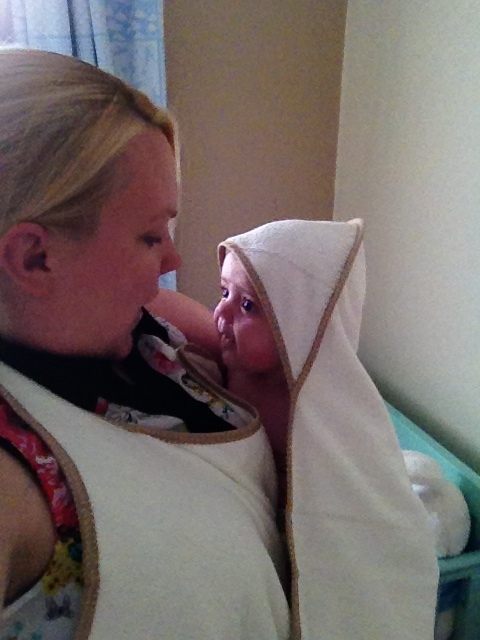 Cuddledry towels are unique hooded apron towels that makes bath time safe for your baby. No more having to juggle to get your baby out of the bath with one hand on the towel as Cuddledry towels are here to save the day! You may have noticed that I have a lovely new badge over there on the right hand side, that's because I am lucky to have been appointed as a Cuddledry Super Blogger and over the next few months will be sharing latest news and offers from Cuddledry as well as trying out some of their new and most loved products. 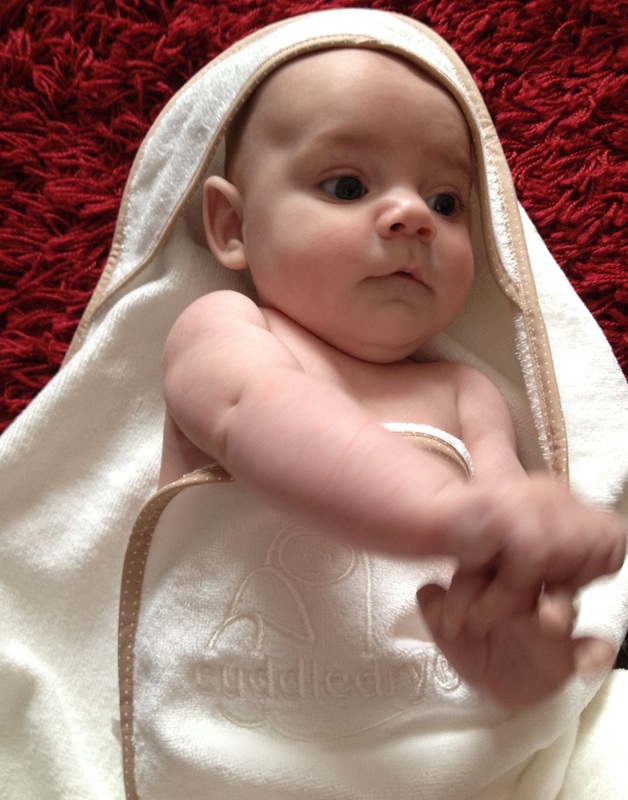 The Cuddledry baby towel attaches to the parent like an apron leaving both hands free. This makes lifting your baby out of the bath easy to simply picking them up and lovingly snuggling them into your arms whilst drying them. 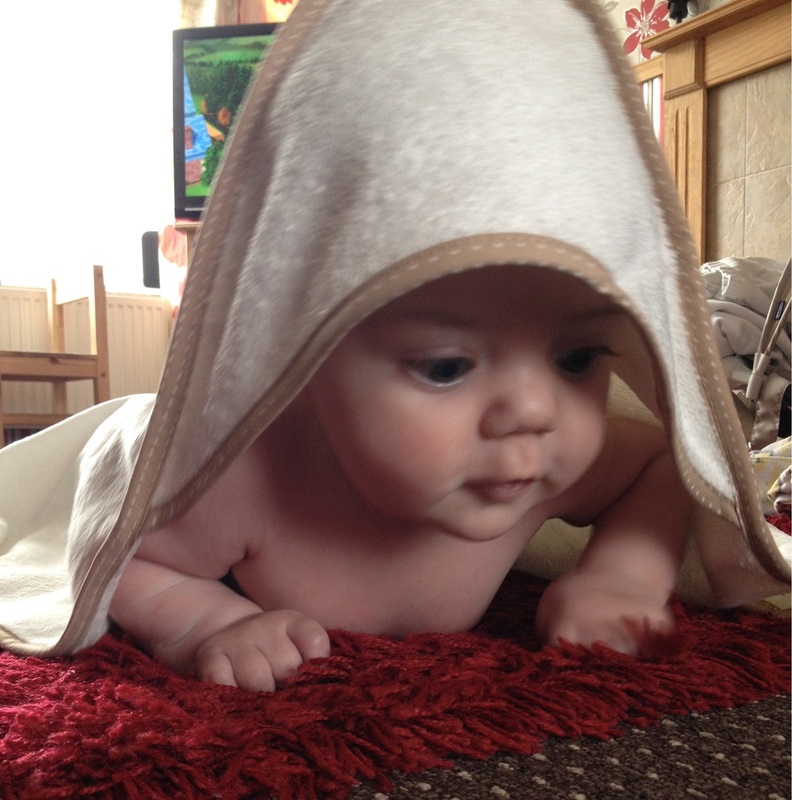 The towel still has a hooded corner to keep baby's head covered too. I was sent the beautiful gingham edge organic cotton Cuddledry to test out with Joseph and to give our opinions on. This super soft baby towel is made with the finest unbleached cotton and natural bamboo fibre, edged with a stylish gingham trim to make it a stand out product. The towel itself is silky smooth to the touch and has a unique double-layer system which draws water away from your baby's hair and skin, it is super absorbent and very fast drying to make sure that your baby's skin is left soft and nestled in a comfy cocoon of luxury. 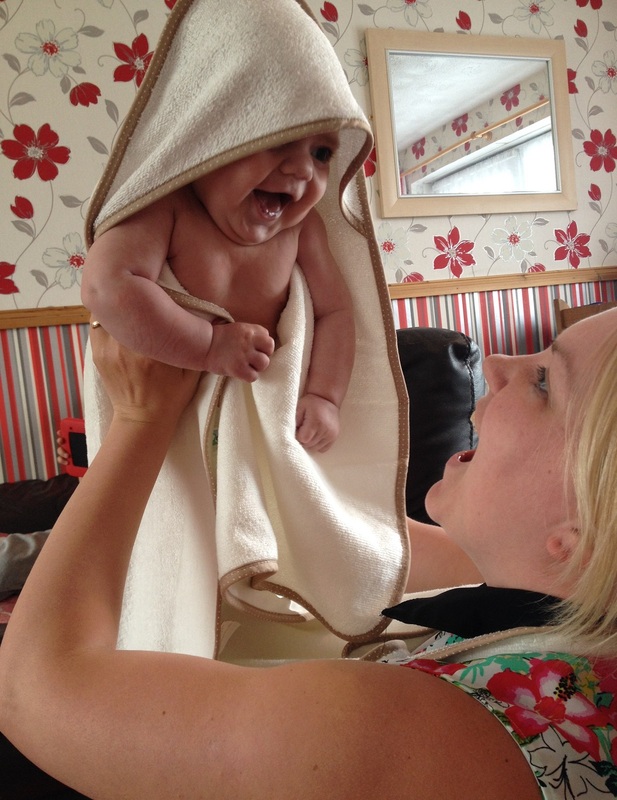 I found the towel so easy to use, two poppers fasten it around your neck like an apron and at the other side of the towel is the hood where your baby will be placed when getting them out of the bath. Just simply fasten the towel onto yourself, scoop up your baby out of the bath placing their head into the hooded part and then snuggle them towards your body, keeping them wrapped up warm and you dry from any wayward splashes. With natural antibacterial properties the towel perfect for sensitive baby skin as it doesn't rub baby's skin up the wrong way, it just cuddles to them, drawing our any water. For Joseph, who has eczema I had found it a struggle to wrap and dry him without annoying his skin before I used the Cuddledry towel but now it's simple as it doesn't irritate his skin at all. I think this is more due to the fact that I now don't need to rub the towel around to dry him, the Cuddledry towel simply absorbs the water quickly without having to move it around. Now, after his bath, Joseph loves having a play and wiggle around in his super comfy towel whilst I know that it is soft on his skin and will dry him super quick without affecting his eczema. The biggest plus for me? No longer having to hold a towel with my chin whilst trying to get a wet, slippery and wriggly baby out of the bath!